Building moisture intrusion may not only cause damage to the building! But may also be a major health hazard for the occupants; breathing mould growth spores is often unnoticed, but over time, can lead to asthma, bronchitis and severe lung infections. Insulation problems, water intrusion and ineffective ventilation can all be causal of moisture and mould growth. Water Damage has a team of qualified IICRC Water Damage Restoration Technicians who are further qualified Thermal Imaging Specialists; when water damage occurs, we are the experts and professionals. 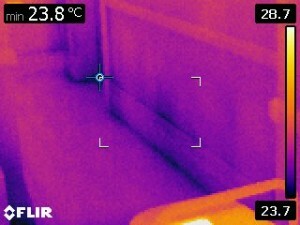 Our trained level 2 thermal imaging specialists are also equipped with high quality Moisture Measurement equipment. We use high quality protimeters which apply a non-invasive radio frequency (ultrasound) to measure the depth of the damp below the surface of any material.